Down syndrome is a huge part of my life, Alex is not anymore. Alex will be leaving in two days to go back to college, and I most likely will not see her until her spring break at the end of March. I know she will call and text and facebook me, but she will not be in every waking thought I have. I try to blog when I can, but without Alex here everyday I often struggle to find something to write about. Instead I read others' stories and comment as appropriate when families with younger children with down syndrome ask for advice. 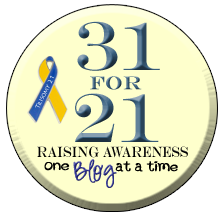 This has become part of my daily routine and kept down syndrome so important to me. I do not want to seem like I know it all, because certainly I don't, but sometimes when I read these posts I want to assure families that everything will be alright. Your little one will grow up, learn to communicate and take care of themselves. Things will be hard at times and you will feel like a broken record in your conversations with your school districts. It will be alright. I wrote a book about our experiences raising Alex and the reviews were quite nice, the sales have been fairly good. I am not an in your face kind of a person, so my attempts at self marketing have been pitiful. 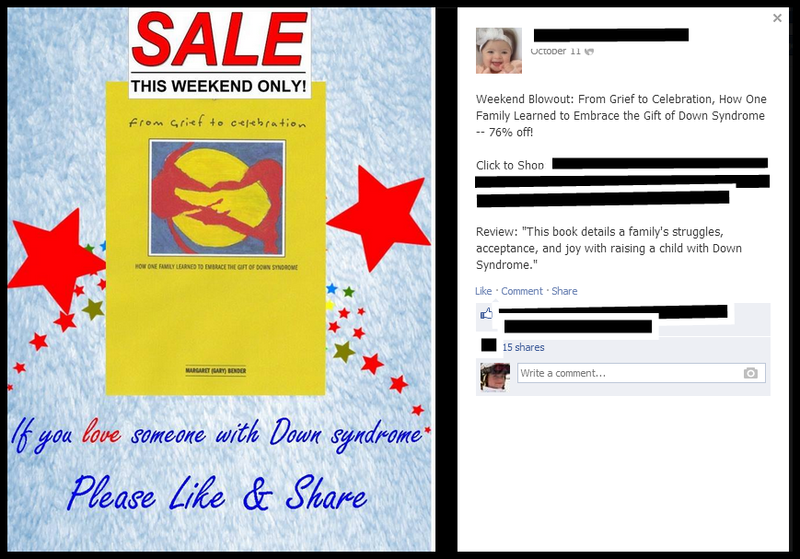 I am so grateful to the down syndrome families who have read and reviewed my book and this has made the difference. 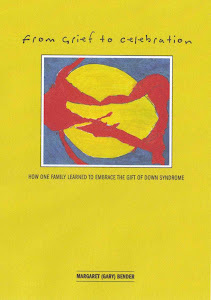 I did not write this book to raise a lot of money, but I do think our experiences can be helpful to families new to down syndrome. 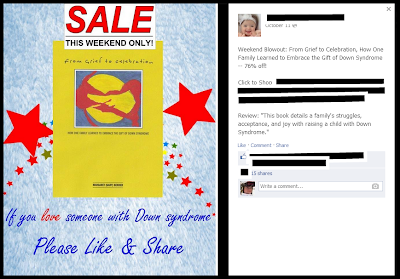 Recently I contacted an organization who has a large facebook presence and represents a lot of down syndrome merchandise. I told them my book retailed for $12.50 including shipping and handling and I agreed to sell them 12 books at $5.00 wholesale. With my shipping costs this was a $0 profit for me, but I just wanted to get the book out there - hoping it would be helpful to others. A few days later I found this picture on their facebook page and website. This group (no names needed) claimed in the ad that my book was retailing for $24.99 and at their price of $11.99 buyers would receive a 76% discount. When I did the math this meant with the $4.95 shipping and handling charge the price of the book was $16.94, or almost $4.50 over retail. I am not sure if I was naïve or just shocked at the dishonesty but I asked for the books to be returned and ended up with a net loss of $20.00 in shipping costs. My book is available on kindle. I have just lowered the price to $2.99, which is the lowest price I can offer if I want to stay on kindle prime, which offers book borrowing and periodic promotions. Please buy my book, I know you will enjoy it. I'm so sorry that happened to you with the dishonest practices of that FB group. Did the owner even attempt to offer any sort of explanation for her actions when you approached her about returning your books and the reason you were asking for them back? That's terrible that she portrayed them to cost much more than they actually do. It is a great book, a quick and easy read! Thanks Michelle, to answer your question when I approached them they told me they thought they paid too much for my book anyway and it wasn't worth it to them. Complete denial of the misrepresentation, a very unpleasant exchange. I can't believe they did that! Your book is great - I like to recommend it to all the new moms I meet. They are notorious for photo-stealing.